So you’ve decided to buy a new bird aviary but you don’t know where to begin. Maybe you have just one pigeon, maybe you have a flock of finches or maybe you even have a couple of oversized parrots! No matter what it is, you’ve come to right place to help you decide the right aviary for you and your birds. Anyone that owns a bird will definitely need an aviary or bird cage (what’s the difference?) of some kind or another. But the aviary that you need will depend upon many factors such as what type of birds you have, the number of birds, whether it’s indoors or outdoors etc. So read on to find out more. This is a type of large enclosure for birds that provides your birds more space to fly around. It’s better for your birds health and happiness but it can be more expensive. Are a smaller and less expensive type of enclosure that your birds will live in. Larger versions of bird cages are sometimes called flight cages but even these tend to be smaller than aviaries. A large enclosure for birds that is typically encased on all sides, except it has an open top roof that is covered in wire or glass allowing the light to enter. Very similar to an aviary and often a term that is used interchangeably. A umbrella term used to cover many different types of avian buildings. 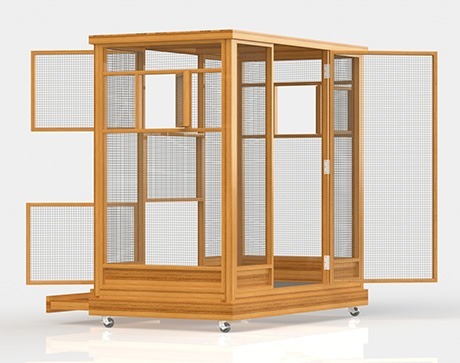 Bird enclosures can take many different formats such as an aviary, cage, atrium, pigeon loft, pheasant pen and more. Note: to confuse matters, companies often list products as both an aviary and a bird cage even when they aren’t so that they cover the keywords for which people are searching online. Finches are very small birds that only need relatively small sized aviaries. Their weak beaks means that the aviary can be built using most materials since they are unlikely to be able to chew or break anything. The bar or wire spacing should be kept fairly small at 1/2″ so they can’t escape through the gaps. Plus, the thickness for this wire also doesn’t have to be very large and can be as small as 2mm in diameter. All of these rules hold rule for a Canary aviary as well. They also only need perches that are relatively small in diameter for their feet. This type of enclosure is typically built for the budgerigar species and so also gets called a budgie aviary. These birds are one of the smaller species of parrot and so only need their wire spacing to be maximum 1/2″ and their bar thickness to be at a minimum 2mm. 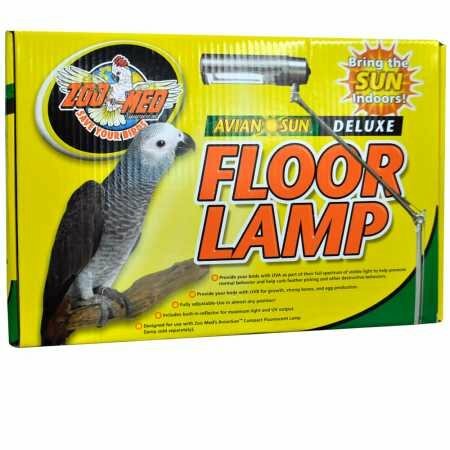 You’ll want a number of different sized perches for your budgies to rest on so that you promote good foot health. Plus a number of bird toys should be included to keep them entertained. The cockatiel is a small species of the cockatoo family that is quite easy to look after. With a cockatiel aviary you need bar spacing that is at a maximum of 5/8″ to 3/4″ and has a bar thickness of 2.5mm in diameter. To prevent diseases such as bumblefoot you’ll want perches that vary in size and some that have coarse textures. Several cockatiels in an aviary work well together. Macaw parrots are medium to large sized pet birds and they come with very powerful beaks. When buying a Macaw Aviary it needs to be very large is size. Because of this you can keep their bar spacing fairly large at 1″ to 1-1/4″ in size. The bar thickness should be fairly wide at a minimum of 5mm and sometimes thicker for the much larger sized macaws. Plus the materials you want these bars to be made from would be wrought iron or stainless steel. Weaker woods and plastics will be easily chewed away. Macaws are smart creatures that will need a number of toys to keep them happy in their aviary. You’ll also need a number of thick wooden perches of varying sizes. Whilst people might search for a pigeon aviary, what these building are typically called is either a pigeon loft or a dovecote. A pigeon loft is used by pigeon fanciers that breed and display their pigeons or by people that are into pigeon racing. A dovecote on the otherhand is typically kept a garden of a large home and is used to keep a small flock of doves. You’ll want a fair amount of room for your quail aviary as these birds like to roam and are often kept by amateur poultry keepers for the eggs they produce. A quail aviary doesn’t need all of the extra features that are needed in a chicken coop, however they will still appreciate some well built shelter that provides rain cover. This aviary normally goes by the name of the pheasant pen and is used to keep these game birds sheltered during the cold winter months. Because pheasants are fairly large birds they typically use aviary netting instead of wiring or bars to keep the birds contained. Birds need to fly. If your bird is placed in an undersized bird cage then it’s health will begin to suffer. Overcrowding with other birds will make fights more likely to occur. This stress will reduces the life expectancy of your pets. Getting the correctly sized, high end bird aviary will prevent these issues and make a happy and healthy bird. The birds can then fly, interact with each other appropriately and form miniature flocks. Aviaries are generally much harder to escape from than bird cages. This is because a lot of aviaries will come with a safety door or at least be made from sturdier materials and so birds will not chew their way out. Losing a bird can be terribly heart breaking but buying a high quality aviary will greatly reduce the chance of escapes. A large walk-in aviary will allow you to enter and even sit inside with your birds. This allows you to better bond and enjoy your birds. You can easily change their food and water as well as clean up. Looking after your birds just becomes generally easier as does making alterations to your bird aviary. If you buy a cheap, low end aviary then things might appear great at first. But after a couple of months of wear and tear, the low quality materials might start to fall apart (especially in outdoor weather heavy areas). Fortunately, a good quality bird aviary can last you for years, if not decades. Good quality wood and metal endures for a long time if it is looked after properly with the correct protective coats and paints. So whilst a good quality aviary might appear pricey at first, you can see how it is value for money when you look at it’s cost over time. First, think about how the bird aviary will function with it’s design. For example, does the aviary come with a floor? Is it easy to change the food and water inside the aviary? Is there a safety door? Will the spacing on the wires be small enough to prevent birds from fitting through? So make sure the aviary you choose matches all of your functional requirements. Second, look at the dimensions of the aviary and then take a tape measure and place it in your home or garden to see if you have enough space. Third, you also want to think about how it looks aesthetically: is the aviary the right color? Will the aviary match it’s surroundings? etc. Finally, do you want it to be a walk-in aviary design so you can enter and interact with your birds? A walk-in aviary might come with a double safety door entrance to prevent escapes. When setting your budget you want to shop around to for price ranges so you have an idea of what you can expect. The price ranges for aviaries can greatly vary from around $150 to $2,000 or even more. Also, the aviary is not the only thing you need to consider as you’ll need other equipment as well such as feeding trays, perches etc. So factor this amount in when deciding upon your budget. If you’re going for an outdoor aviary then you need to consider the climate that you’re living in. How hot and cold will the aviary be at different times of the day and at different times of the year as well. Also, will the aviary have any shade for the birds or will they be in direct sunlight all day long. On the other hand, an indoor aviary doesn’t need to be as strong or resistant. The need for a safety door to prevent escapes also isn’t as necessary because escaped birds will still be in the house if the windows are closed. However, if you have an indoor bird aviary then you need to consider how the aviary will be cleaned so that mess doesn’t spread in your house. The material that the bird aviary is made from is of the utmost importance and will decide how long the aviary will last. Metal is better than hardwood and hardwood generally tends to be better than softwood. However, when it comes to wood a lot can depend upon the type of wood that you’re buying and what finish or protective paint has been applied to the wood. You also need to consider if your birds are chewers or not – birds that chew will need stronger wiring to prevent escapes. Build quality is especially important for outdoor aviaries as you’ll want materials that are water, wind and snow resistant depending upon your environment. Last but not least, you need to think about how strong the aviary is to prevent any intruders such as foxes, raccoons, mice etc. A bird aviary can usually be built within a couple of hours. 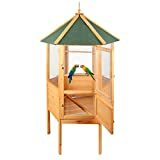 But you might want to check if the aviary can be put together by a single person or if 2 people are needed to fit the parts together. The bigger the aviary is, the harder it tends to be to set up. Bigger aviaries also tend to be harder to move around once set up. Metal aviaries are generally heavier and so are harder to put together. Also, see what people are saying about the instructions in terms of how clear and detailed they are. Great, unique design – white/dark brown. Made from water-resistant fir wood, very lightweight. Very lightweight, weights needed adding to bottom in windy areas. Who this aviary is for? People that want an aviary that gives value for money and only have a small number of birds. If you want good value for your money then this 64″ Vertical Pawhut Aviary is hard to beat. However, this is recommended for indoor use. If you decide to use this aviary outdoors then you should expect to do some minor modifications. Install some smaller spaced mesh and add some weights to make it more sturdy. Fantastic, beautiful design – looks brilliant. Many built-in features for birds to play with: trays, frames, bowls, ladders etc. 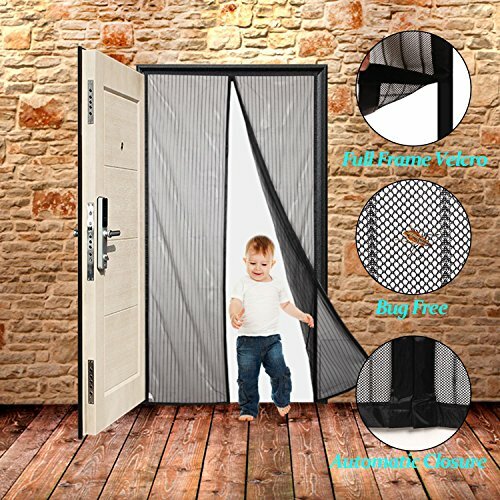 Easy to access with 3 doors of different sizes, stops birds flying out. People that like spacious, aesthetically pleasing aviaries. 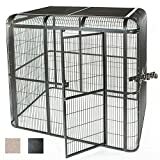 However, this isn’t really for use as an outdoor aviary unless you’re prepared to modify the aviary or you live in a mild climate. This Trixie Pet aviary is a lot more spacious than it appears in the photos and it’s design really is very pleasing to the eye. What’s more, I’ve yet to see another aviary with as many built-in features. 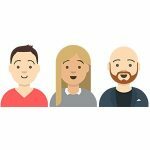 The main drawback is that there are reports of people having packaging issues with damaged parts arriving. Fortunately, this only appears in a small number of cases and the one year warranty will cover you with a replacement if this is the case. Professionally stylish with dark wood coloring. Sturdy materials made from cypress fir. 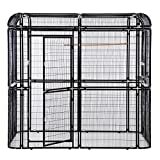 A mid-range priced aviary that’s very spacious and comes with a small flight cage. Can be constructed within a few hours even as a single person. Wood is soft so may need sprays to prevent chewing. People that need room for a few medium sized birds or a number of small sized birds. Isn’t really needed for just 1 or 2 birds unless you’re feeling extra generous. Large aviaries such as the Advantek Portico do come with a mid-range price tag, but your money really goes further with the extra space that you gain. 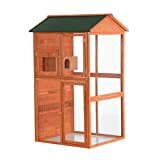 This aviary is aimed at owners that are looking to house a number of birds. A strong advantage of the aviary is the double door feature which adds an extra layer of safety for owners that are concerned about escapes (which tends to be a higher factor the more birds that you have). Made out of cypress fir wood the material is insect and rot resistant (plus it comes from a sustainable forest). However, it may be worth buying an extra spray for the wood if your birds are chewers. The wire is stainless and rust proof with spacing measured 1/2″ x 1/2″ so it can be used for small birds as well. Overall, I’d choose the Advantek Portico Aviary if your key requirements are to be able to host a number of birds and for the aviary to be walk-in. Looks good and has lot’s of space to cater for almost all pet birds. Fairly straightforward to set up but there are no instructions! You want the best for your birds, you need extra space, you want quality. However, if you’re on a budget then this obviously isn’t for you and your birds. This aviary is built to last even longer than you will! Made of powder coated wrought iron, it has the strongest durability and build quality of any aviary on the market. 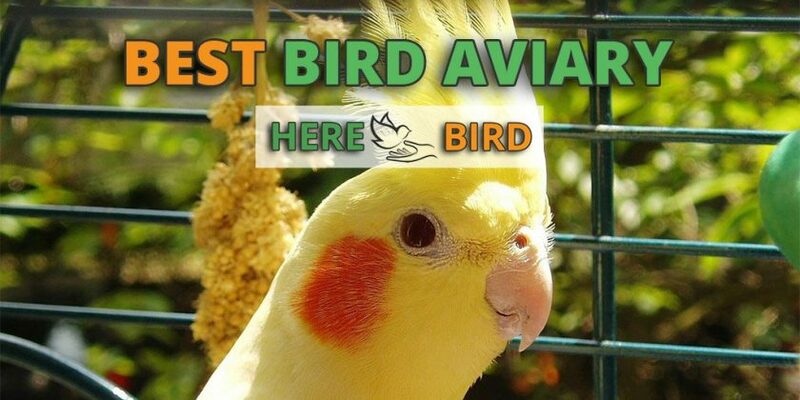 It’s very spacious and will cater to almost all birds plus it comes with a 6 month warranty. It’s not without it’s drawbacks though. Firstly, it’s very highly priced so only the most dedicated bird owners will consider this option. Second, it’s straightforward to set up but many users are reporting no assembly instructions being included. Thirdly, you’ll still need to furnish the inside of the aviary for your birds with perches, feeding stations etc. However, when it comes to quality, these are only minor inconveniences for this aviary. You can easily look past this if you want to own one of the best aviaries on the market. A bird aviary will be empty and uninviting on it’s own. That’s why we recommend you fill it with a number of accessories to keep your bird happy. You can’t just place any plant in your aviary because some plants are actually unsafe and poisonous to pet birds. 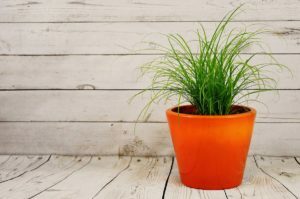 Discover the full list of plants that are safe for bird and ones that should be avoided, available here. A simple mesh screen on the door of your aviary will help to prevent a bird from flying out. Birds simply don’t like flying into dangling objects. Whilst it’s not escape proof and a determined bird could still fly through the doorway, this will reduce the chances of it happening. Click on the image of the mesh screen to find out more. Your birds will need shelter from the sweltering heat and cold rain. 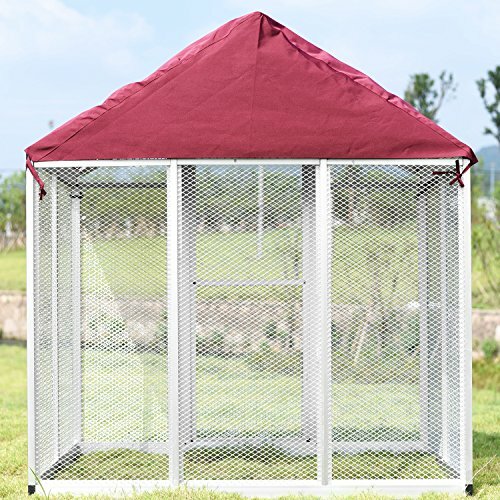 Some aviaries have an open top or don’t provide much protection on the sides, which is why recommend an aviary cover for this extra layer of protection. Click on the image of the aviary cover to discover more. If a bird is kept in an indoor aviary then there’s a good chance that is not receiving full spectrum lighting (something required for the health of birds). An aviary light can provide proper lighting and fix this health issue. Either click on the image to see aviary lighting on offer or see our full guide to it available here. 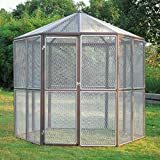 There are many new and improved bird aviaries released every so often, so I’ll keep these reviews up to date as new products come out. Let me know if you have any suggestion.